Our students come from diverse backgrounds and have differing levels of efficiency, problems and needs. Hence Class Patrons, Coordinators and the Principal take care of every student accordingly on an individual basis. In addition, for those who require more help, we provide the services of a professional School Counsellor. Mrs. Neeti Sarkar-Wesley is our full-time Student Counsellor. She has been professionally trained to aid children at school deal with a variety of issues and/or difficulties they go through. At Clarence, the Student Counsellor also annually organises/ conducts well-structured Career Guidance programs for students of the senior school, seminars for parents of all sections of the school, and Life-Skills lessons across all classes, through the academic year, where pivotal issues such as personal safety, health and hygiene, bullying, peer pressure, character building, goal setting, self-acceptance and self-worth, among other topics, are dealt with in an innovative and student-friendly manner. Parents are kept in regular contact right thorough the year with regard to attendance, academic progress, discipline and health. Class Patrons and Subject Teachers make themselves available to any student in the class to clear any doubts and provide extra help or just to get to know each other better. There are fixed times and sessions allotted for the same. The Canteen is one of the liveliest places on campus. When the siren sounds, students race to get their favourites from the Canteen, meet their friends and catch up with news and views. The Canteen is well-ventilated and spacious and provides affordable quality food to staff and students. Our canteen provides all kinds of food. You would get the vegetarian food and the non-vegetarian food. You have the rice varieties which may include the normal meals or fried rice and also fast food kind of items which includes sandwiches, rolls, wraps, burgers etc. 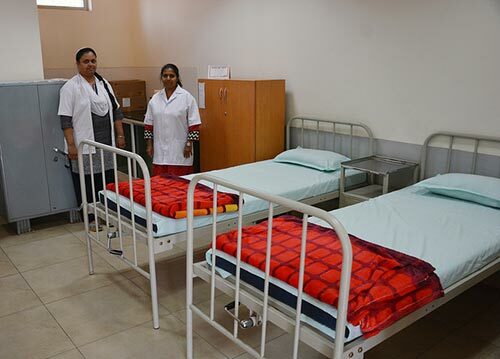 The renovated and upgraded Infirmary has three new adjustable cots, a nebulizer and an oxygen cylinder. Two qualified in-house nurses have been appointed to provide immediate medical assistance for sickness and injury. Further consultations are held with a consultant pediatrician. Children needing additional medical attention are referred to the nearby hospitals with information to the parents.